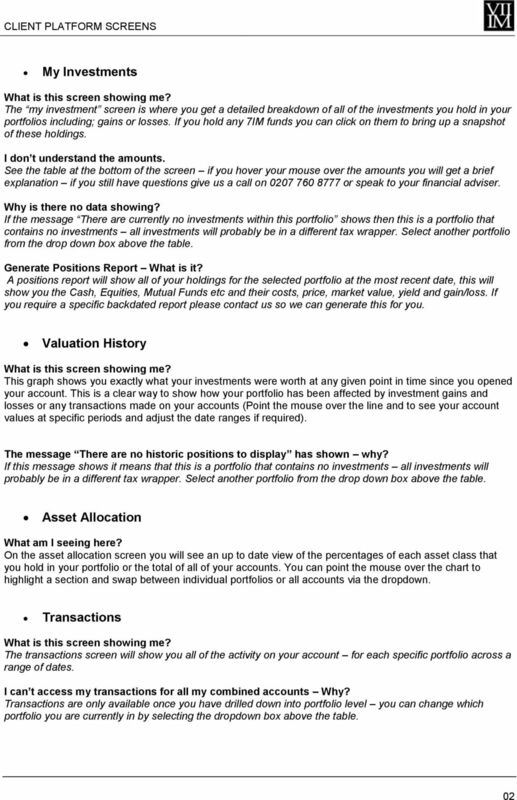 Download "A FRESH NEW LOOK FOR YOUR INVESTMENTS"
1 A FRESH NEW LOOK FOR YOUR INVESTMENTS A handy reference guide We are delighted to bring a new look to the client portfolio screens on our website. 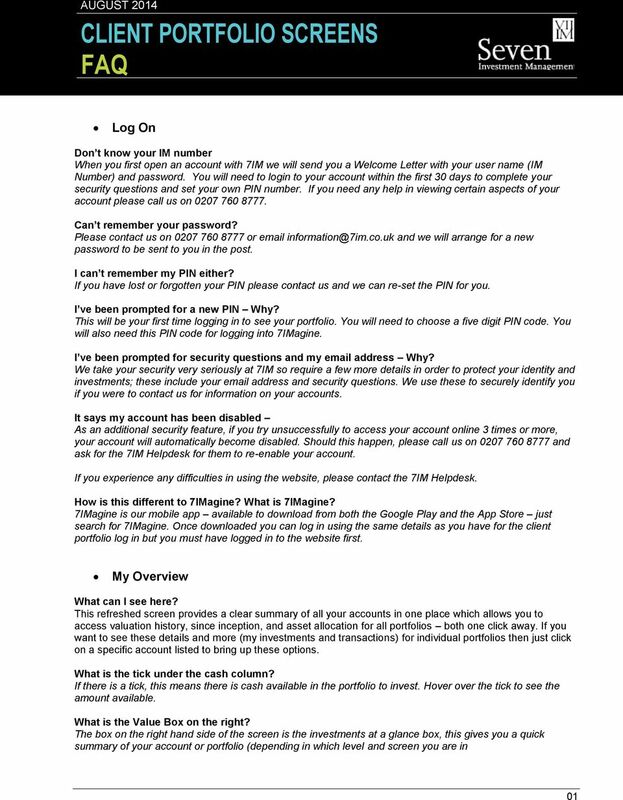 We hope you enjoy using them; you might want to keep this guide to refer to the first time you log in after 1 September LOGGING IN You still log in from the same place as usual and there is no change to the information you will be asked for it will be your User name / Account number, beginning IM, followed by 2 characters from your password and the 5 digit PIN that you have set up. If you have forgotten your Account Number, Password or PIN, please us at 2 SECURITY QUESTIONS AND ADDRESS We will be making your valuation reports available online in 2015 and will need to let you know when they are ready to view on the website. We will be doing this by , so we will be asking you to enter or re-confirm your address when you login. We will also need to capture your answers to 4 security questions if we don t already have these in our systems and will use these to identify you if you ever need to contact us by telephone. You will only be asked to complete the security questions once. 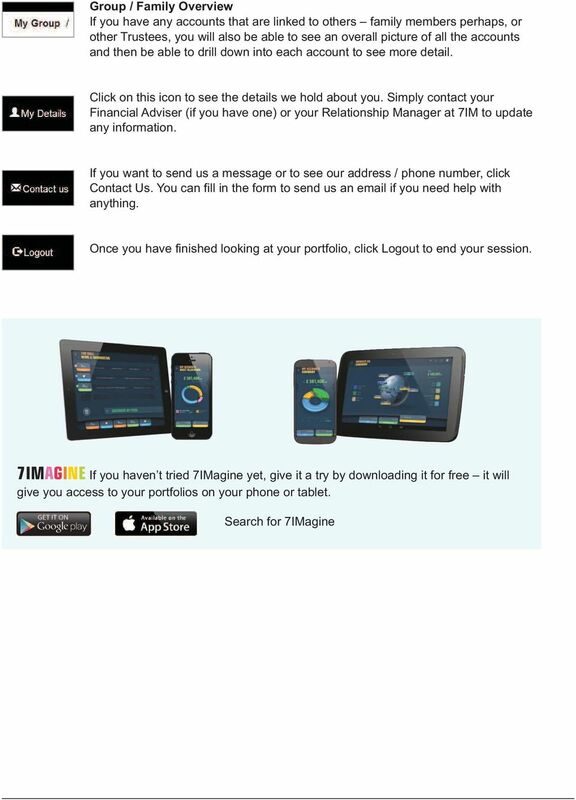 2 3 MY ACCOUNTS This now looks a lot more like the screens you will see in our app, 7IMagine. You can see an overview of your accounts with the option to drill down into more detail in several ways. You can click on the name of the account or you can click on one of the buttons under the pie chart to see additional data. 4 DETAIL PANEL Click on the magnifying glass to see the cash and assets that have been added to, or subtracted from, your account. 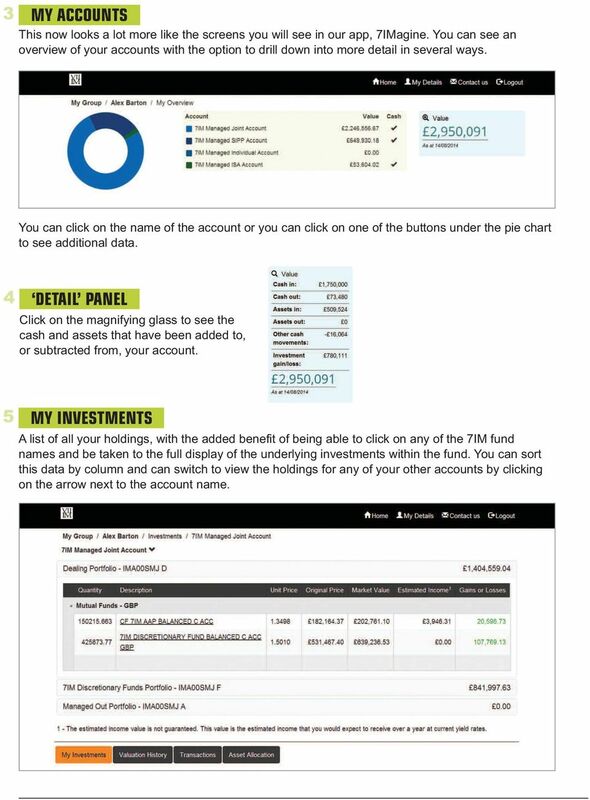 5 MY INVESTMENTS A list of all your holdings, with the added benefit of being able to click on any of the 7IM fund names and be taken to the full display of the underlying investments within the fund. You can sort this data by column and can switch to view the holdings for any of your other accounts by clicking on the arrow next to the account name. 3 6 VALUATION HISTORY This chart shows you what your investments were worth at any given point in the past; if you hover over any particular point you will be able to see the actual value shown in. You can see this as an overall view for all your accounts or you can change to see a specific account by clicking the arrow next to All Accounts and choosing the specific account you want to view. You can also change the date range by clicking the arrow next to the date at the top of the graph, which will automatically have displayed the last 3 months. 4 7 TRANSACTIONS This lists all the transactions that have taken place in a particular portfolio. You can sort this data by clicking the top of the column you want to view and also view the transactions within a date range by choosing the dates you want. Simply click the arrow next to the current date at the top of the page to bring up the calendar again and then choose the dates. You can also switch between accounts to view by clicking the arrow next to the account title. 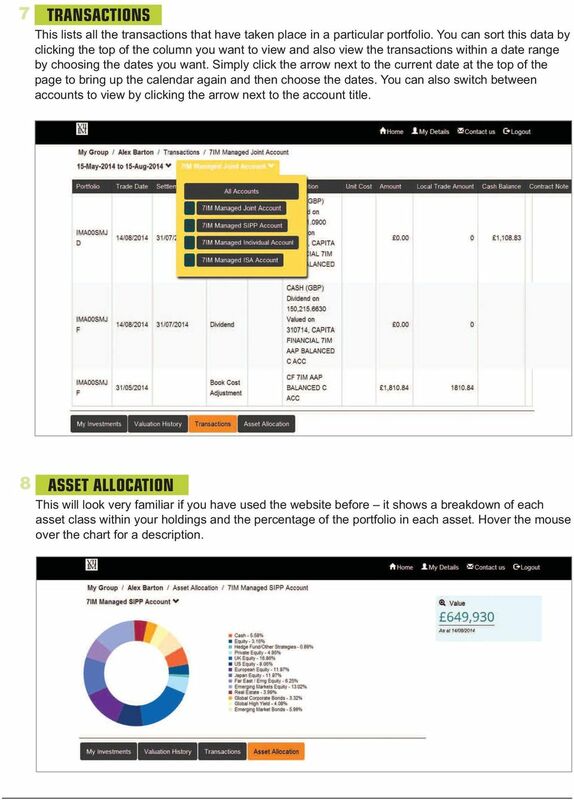 8 ASSET ALLOCATION This will look very familiar if you have used the website before it shows a breakdown of each asset class within your holdings and the percentage of the portfolio in each asset. Hover the mouse over the chart for a description. 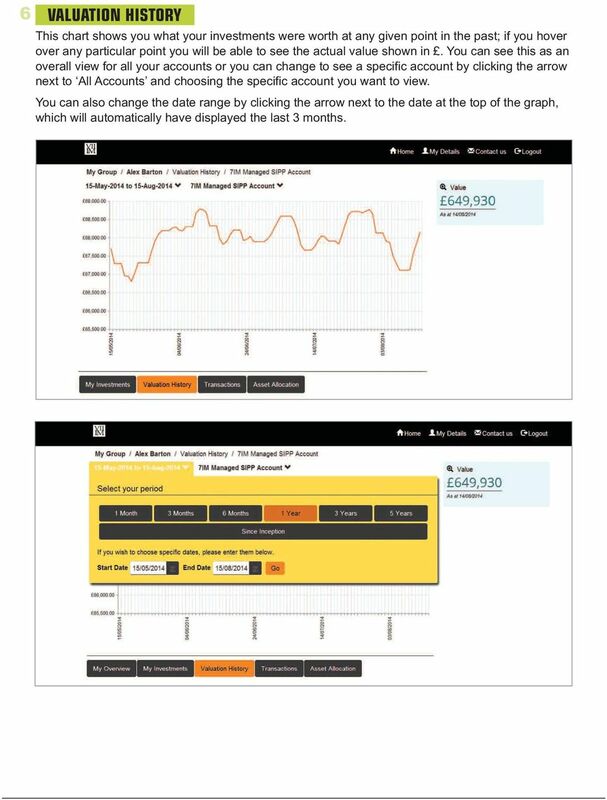 Track, analyse and top up your investments online with your personal client site. 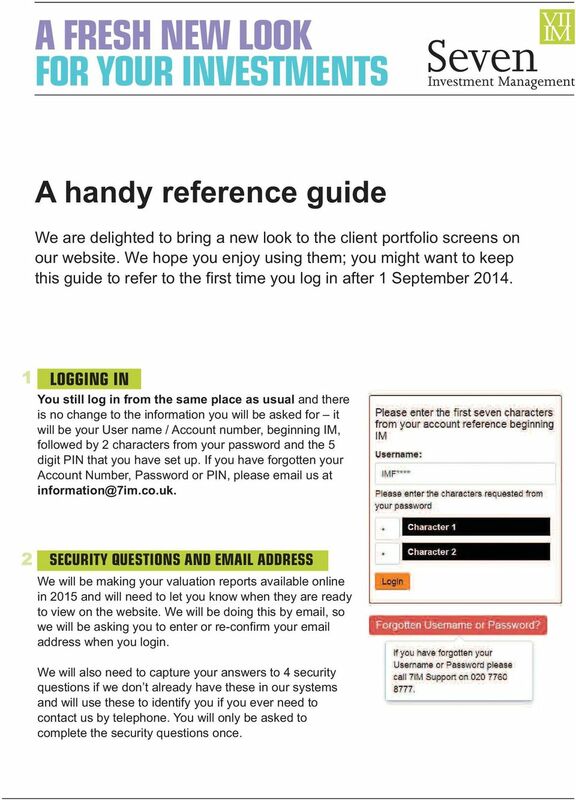 SELF INVEST SERVICE FAQ JULY 2015 LOGGING ONTO THE CLIENT PLATFORM HOW DO I VIEW MY ACCOUNT ONLINE? 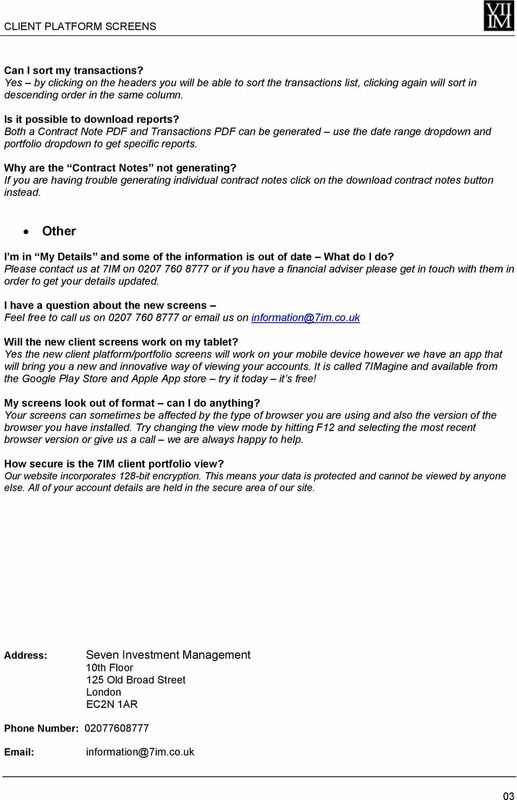 When you first open an account with 7IM we will send you a Welcome Letter with your user name and password. MYTIMETABLE STEP BY STEP GUIDE CONTENTS 1. Accessing MyTimetable... 1 2. Using MyTimetable... 2 Adding a timetable... 2 Deleting a timetable... 3 3. The desktop site... 4 4. MyTimetable mobile... 5 5. Once you ve signed up, all you ll have to do is sign in. To sign in key in your e-mail address and password.